There was a bit of a stampede on Thursday and Friday as foodies rushed to be among the first to check out Nama Nama, the new Japanese cafe opened by Izakaya Den owners Simon Denton, Miyuki Nakahara and Takashi Omi on the old Verge site. I like that there's now a cafe serving Market Lane Coffee so close to my office, and I'll definitely be signing up for bento membership with my very own reusable bento box! Will report back, readers. Speaking of coffee, there are two serious coffee cafes due to open this week: Common Galaxia and Clement Coffee. Common Galaxia will be open from Tuesday at 130 Victoria Street, Seddon, brought to you by the folks from Dead Man Espresso. Its name comes from a type of native fish found in the Maribyrnong River. Clement Coffee is opening in a tiny site in South Melbourne Market by Kris Wood (who you may recognise from his previous stints at Proud Mary, Sensory Lab and St Ali). He'll be doing his own roasting off-site. It was a close call, but I hereby decree that The Cornish is the best sandwich at Pope Joan. 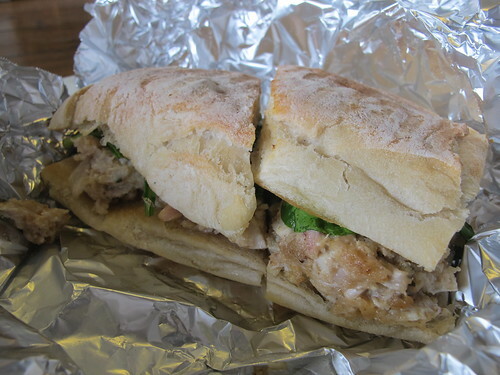 Roasted Milawa chicken, stuffing, lettuce and jalapeño ($12). You know that slightly funny-looking apartment building in Collingwood on the corner of Peel Street and Cambridge Street, the one with the wavy facade and porthole windows? 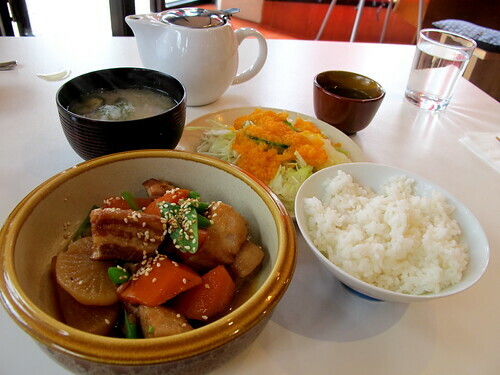 A great little Japanese cafe called Akasiro opened on its ground floor a few months ago. They serve eleven kinds of teishoku (set menus): on a cold Sunday afternoon I enjoyed the buta-kakuni teishoku with slow-cooked pork belly and daikon in a soy and sweet sake sauce ($18 with all the rice, salad, miso trimmings). 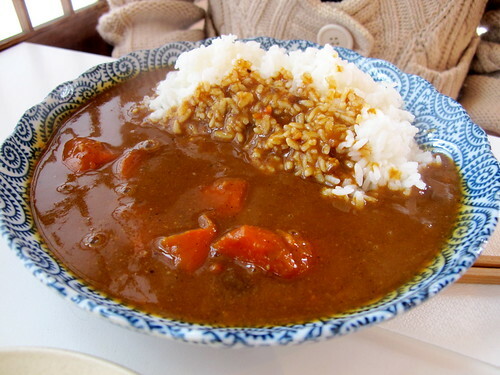 They also do a very good curry based on the chef's grandfather's recipe ($8). Akasiro doesn't have a website or a phone number but you can find them at 106 Cambridge Street Collingwood, Tuesday to Sunday 11am to 4pm. If they swing a liquor license they hope to open at night down the track as an izakaya. There's nothing wrong with going next door to Bill's Bar for a quick single malt while you're waiting for your take away Huxtaburger, is there? 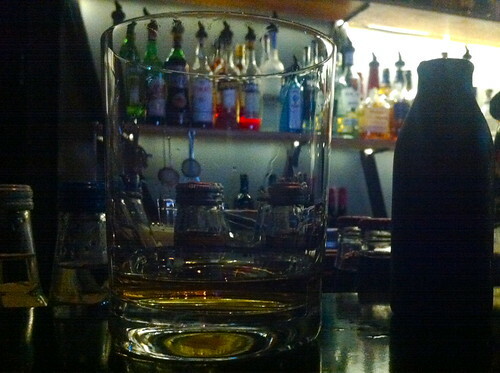 I'm not necessarily saying that I did... but I will note that the Yamazaki 12 year old they're serving is velvety smooth. Oh, and Bill's flat pricing structure (all spirits $9 each) means that you can get some really interesting drops for a very good price. 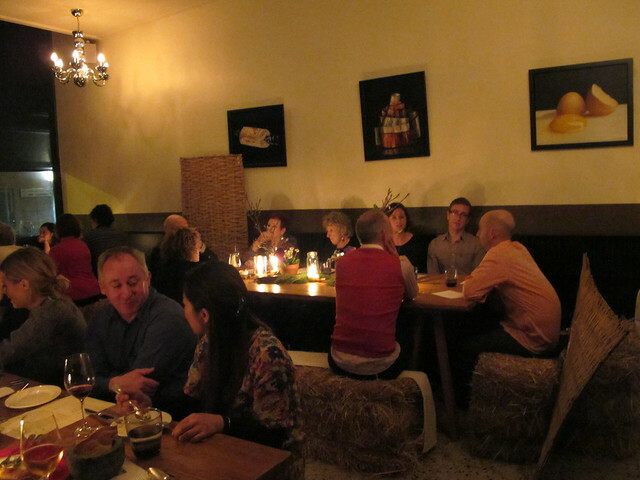 The Farm Barn Restaurant dinner at Embrasse the other week was a lot of fun (for those keeping score at home I paid for my dining companion's seat, but my seat was on the house): we were seated on hay bales and surrounded by farm equipment and giant pumpkins. Chef/owner Nic Poelaert welcomed us and spoke passionately about the local producers who supply Embrasse and about the rustic meals he enjoyed growing up in France that had inspired the dinner. 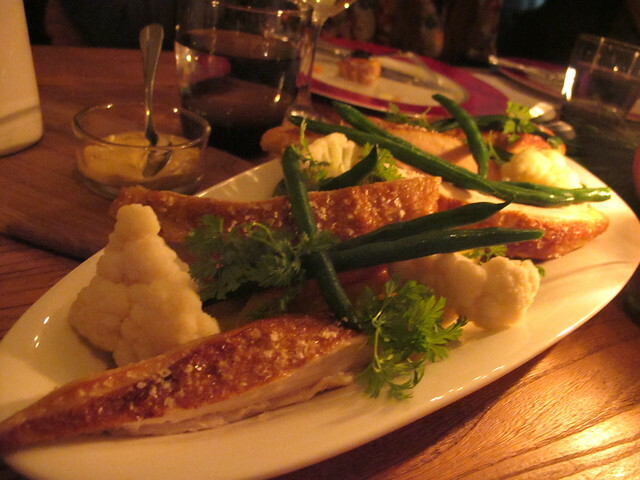 Menu highlights included Nic's father's onion soup, roasted Bendigo chicken with aligot and the pear & frangipane tart. I've previously written about Embrasse here. - Heading to Barcelona soon? You should take a market tour and cooking class with Papa Serra (run by a lovely guy who used to write a Melbourne food blog). - This week in depressing news: there will be a pop-up Masterchef restaurant in Sydney next month (via Prick With A Fork). - A great article by Jancis Robinson on what Twitter has done for wine. - My favourite new Melbourne food blog: Croissant Smasher, in which a Frenchman rates the croissants of Melbourne looking for the perfect buttery/flaky specimen. - Submissions have opened for the Eat Drink Design awards, the inaugural awards program dedicated to hospitality design. 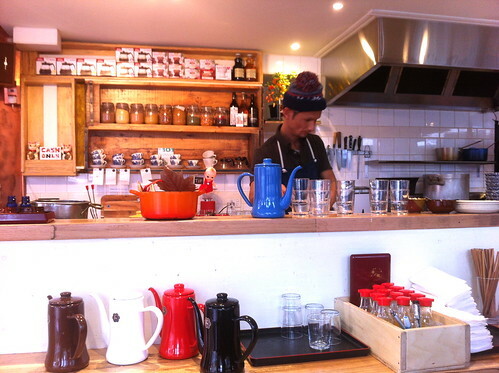 Is there an Australian or New Zealand hospitality project you think deserves recognition? - Eating local hurts the planet: two scientists challenging the locavore philosophy. - Did you hear about Argyll and Bute council, the Scottish council that provoked an uproar by banning a nine year old food blogger from taking photos of her lunches at school? Read about how the story progressed here, here, here and here. 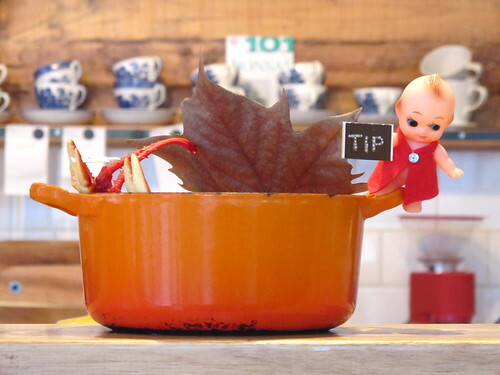 - Tips from the HiP Paris blog on avoiding bad food in Paris. - Former Aussie-based, now Korea-based blogger Pikelet & Pie writes about gopchang, one of the uglier delicacies in Seoul (cow’s small intestine, for those who were wondering). - Haha, Amateur Gourmet: how to fake your way through law school while secretly becoming a food writer. - The last link is a bit of self-promotion: I was interviewed by Milk Bar as part of their Melbourne blogger profile series. 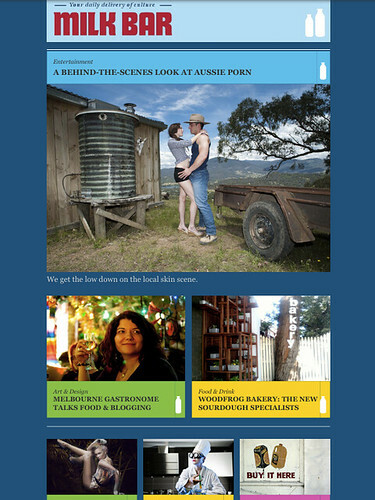 See below: Milk Bar is bringing you the latest news about sourdough, Melbourne Gastronome and Aussie p**n. Something for everyone! I shall also pass on the Korean food blogger link to my friend who is just about to spend a couple of weeks there.